Dale Thomas Knobel says he's been on "a tour of American higher education." He's taught and served as associate provost at a major public university and held the post of provost at a national liberal arts college, and he is now president of Denison University. At Texas A&M University, where he worked from 1977 to 1996, Knobel served as executive director of honors programs and then as associate provost. He gained insight into the administration of a 45,000-student institution, which he likens to "steering an aircraft carrier." 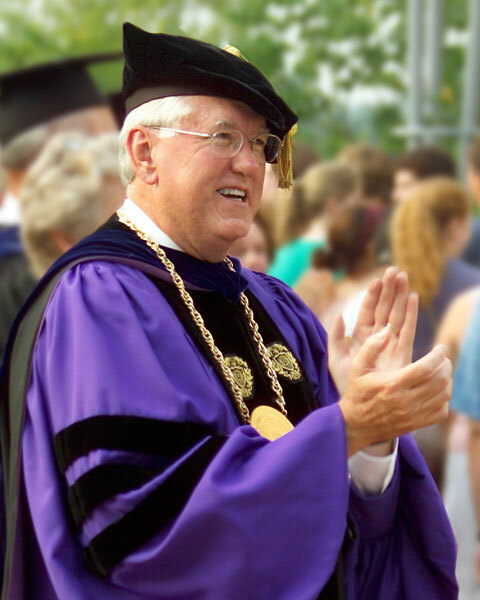 At Denison, in Granville, Ohio, where he arrived in 1998 after serving as provost at Southwestern University in Georgetown, Texas, Knobel has endowed new faculty positions while lowering the number of students admitted, creating a 10-to-1 student-to-faculty ratio. In spite of his early quip that he "didn't have an edifice complex," Denison has invested $100 million in buildings and facilities since Knobel's arrival. And the school's endowment has more than doubled, to $647 million. In contrast to Texas A&M, "At places like Denison and Southwestern, you can have quite an immediate impact," he says. "You throw the rudder, and the ship turns." Knobel's Northwestern doctorate launched his long and successful career as a historian. "I continue to enjoy teaching," he confides. "I sneak out every now and then and teach an undergraduate course." But the degree provided more than that. "I also gained an appreciation for the role that really good and dedicated faculty can play in education. It was a marvelous history faculty at Northwestern, a number of whom I continue to count as friends and mentors."